The Quiet Place takes place in 1957, as young Isabel and her family move from an unnamed town in Mexico to what appears to be Detroit. The front endpapers, frontispiece and title page depict unhappy people, skinny dogs and a small wagon hitched to the back of the family’s battered car, which holds all their belongings—some chairs, a dresser and a few boxes. Isabel loves her cardboard box; she feels safe and comfortable in it. The author and illustrator may not have intended for this to be a metaphor, but it is loaded with significance. Isabel’s box fills the entire book cover. On the blue flaps, she’s drawn Mexican designs of sun, moon, stars, plants and animals. The inside “walls” are bright yellow, as is Isabel’s dress. There’s an orange shining sun on top and a shuttered window drawn on the side. On the floor, there are books, crayons, and her teddy bear for company. From inside her “quiet place,” Isabel, with a book on her lap, is looking out and smiling. There are no other Mexican families in Isabel’s new neighborhood, no other children who share her life, who speak her language, who play games with her. When a rainstorm destroys her “quiet place,” she is inconsolable. But soon, she’s able to accumulate more boxes, ones that had held presents for the white children for whom her mother has been catering birthday parties. 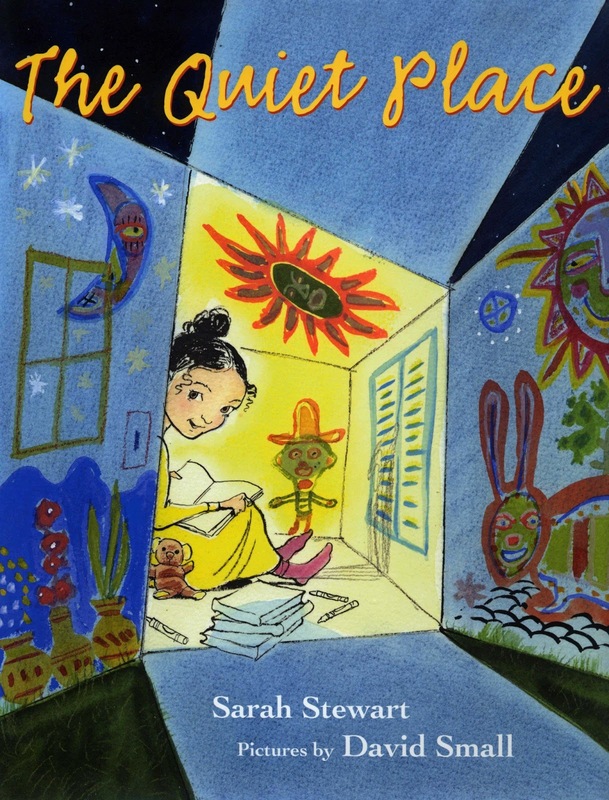 First, setting this story in 1957, when thousands of Mexican workers were being recruited to work in Chicago’s meat packing plants and Detroit’s auto and steel industries, is the author’s and illustrator’s convenient way of evading the racist and violent historical and contemporary realities for immigrant and migrant Mexican workers and their families—and presenting a feel-good story for the intended audience. It’s clear that this intended audience does not include Mexican children. It does not include young children for whom Spanish is their first language. It does not include young immigrant or migrant children. And it certainly does not include young children of color. No one in this story speaks Spanish, not even a Mexican mother consoling her child. Indeed, the only Spanish words here are “salsa,” “tamales,” “guacamole,” and the phrase “muchas gracias,” which is immediately translated into English. Since young Isabel already reads and writes fluent English, she has no issues involving learning or adapting to a new language. In fact, in Isabel’s world, there are no issues—no violence, no discrimination, no racism, no bullying, no taunting, and no suffering—because author, illustrator, and publisher do not have to see any. Suffering, like the children in crisis on the border. Now. Terrified mothers and fathers are sending their young children to the north, because it’s too dangerous where they live. Sometimes in the company of smugglers, these refugee children are literally running for their lives. When they get here, they are picked up by the Border Patrol and brought to detention centers with no schools, no books, and no permission to be reunited with relatives in the US. None of these thousands of unaccompanied children coming from Mexico or Central America in the last few years has been given a visa. These lonely, frightened refugee children are living in limbo—they miss their parents, their grandparents, their aunts and uncles, their cousins, and their friends—and they have no idea of what will happen to them. Under the illusion of “diversity,” The Quiet Place portrays immigrant and migrant children as successful as long as they quickly and easily learn English and adapt to the dominant culture while discarding their own. 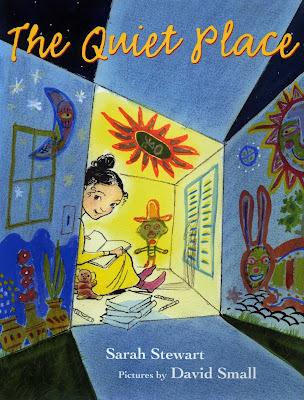 Here, the author, illustrator and publisher have transformed Mexican and Mexican-American children’s real lives, experiences and problems into a feel-good, pain-free picture book about assimilation for young readers who have never been forced to face the enormous difficulties associated with immigration or migration. And in doing so—in giving a young Mexican girl a discarded box to live in—the author, illustrator and publisher have contributed to the public shaming of Mexican and Mexican-American children, as well as of all immigrant, migrant and refugee children in this country. Imagine a teacher’s reading this book to a classroom of kindergarteners in, say, El Paso. Imagine the expressions on their faces. Imagine the shocked silence and the silent tears. What an awful thing to inflict on our children. The Quiet Place is not recommended. I have to disagree with this review. I loved the book. My kids loved to play with boxes of all kinds and really showed their imagination, just like the box "city" at the end of this story. I tried to submit a comment before about this book, but perhaps you only approve comments that agree with your POV. I think sometimes people get so caught up in looking for racism that they miss the point of the story. I am definitely adding this to my collection. Wow, now this review caught me in shock Beverly. This is the first time I have come upon this book, but I must level with you - I adore the work of Sarah Stewart and her husband David Small, who collaborated on one book that always makes me cry -The Gardener- and another that unfailingly moved and charms me -The Library. I actually was rooting for The Gardener to win the Caldecott Medal that year. It did wind up with an Honor. Yet, despite my efforts to be comprehensive this book has eluded me. I am sorry to hear what you have revealed, and of your summary judgement, but in view of what you say I can't blame you. Your superlative review is vivid enough in telling what one sees and perhaps more importantly what one doesn't see- but still I want to look at it and will get a copy on loan from our system within the next day. Ah this is too bad, these artists have done such lovely work otherwise, and of course Small has won a Caldecott and two Honors. Yet, these are admittedly tough charges to counter.